I’ve been trying very hard to actually wear all the jewelry that fills eight drawers of my tower jewelry box. I usually wear a necklace (that I never take off, although I stupidly wore it when I got my hair colored and now it needs to be tended to; won’t do that again), earrings (sometimes, not every day), and bracelets. Sometimes I wear a watch and sometimes I do not. Lots of sometimes. Going for all the times. The three bracelets, necklace, and matching earrings on the far left came from Grey Goose Gifts at etsy.com. I wear the bracelets daily and have since I got them last year. Necklace and earrings are in rotation. 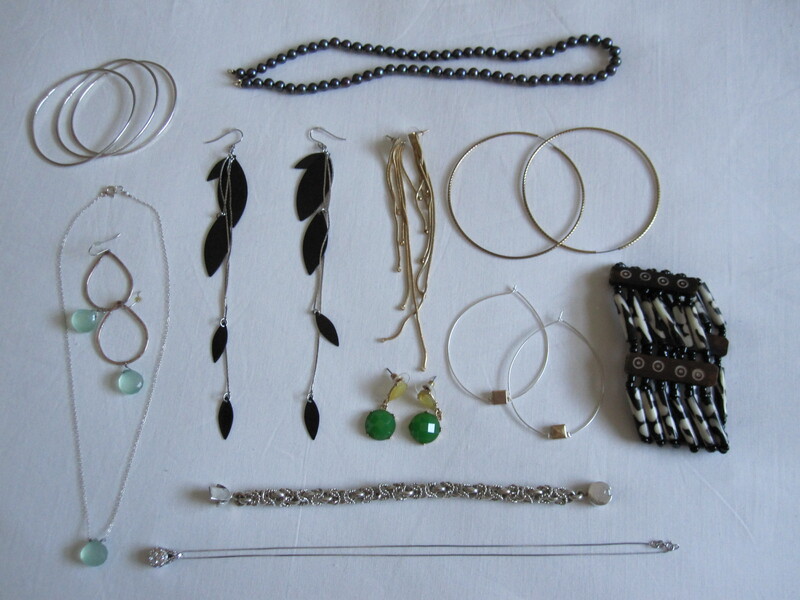 I have about six pair of earrings, several necklaces, and rings. I love everything and want everything (hint, hint). The black pearls at the top were my graduation gift when I received my 2nd bachelor’s degree. There is a matching bracelet that I like to wear. I’m into stacking bracelets now. The necklace at the bottom was a gift and it’s gorgeous, and I thought I had lost it once and nearly had a coronary. Now I’m very careful with it. The sterling silver bracelet above it came from Mexico on a trip in college when I got my 1st bachelor’s degree. The man at the flea market chased me out onto the street after I said I didn’t want it after all. I am so glad he did (even if he did scare the crap out of me). The long earrings in the middle came from Old Navy and Target. I am obsessed with having earrings as long as my hair. It’s from my other obsession: The Fabulous Baker Boys. Michelle Pfeiffer’s earrings in that movie moved me. The other earrings are from Target. A little bit of an earring splurge this weekend. Sparkly is my favorite color. And last but not least, the bracelet on the far right made by a woman in Kenya through the Journey The Ed Colina Foundation. He does amazing work. Great organization to make your donation. So, if you run into me soon and I’m weighed down with eleventy bracelets and fortyteen necklaces, you’ll know why. Equal time, people. Equal time.